3 Best Ab Lounger Exercises and Workouts you can do on your Ab Lounger today. These Ab Lounger exercises and workout routines work, so lets create an exercise plan for you to get six pack abdominals. Of course for all those that have tried different gimmicks and programs, one thing is certain; great looking abs don’t appear by passivity. Great abs comes from work and we all know what that is; the king of abdominal exercises is the crunch and it is difficult to eliminate this in any exercise program for developing abs. 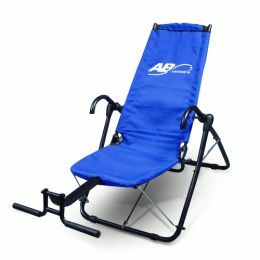 What does the Ab Lounger Bring into Ab exercising? Though the crunch cannot be avoided and almost everybody knows it, very few can execute it naturally without help of some sort. The Ab Lounger (also known as the AB lounge) acts like a helper for your crunches. It looks like a recliner with straps for the hands and support for the feet, and it supports your whole body, protecting you from the nasty neck pain and difficult motion that most people suffer from when performing crunches. You can start this exercise in either a lying position or a sitting position. Adjust the Ab lounger foot rests to match your height. Put your hand under the hand grips for support, and your legs under the foot rests. When you have anchored yourself correctly, try to bring your hands and your feet together without bending them at the joints. This will produce tension in your Abs which is what works your abs muscles. Hold the hand grips firmly, and make sure that your feet are well behind the foot rest. Pull in your abdominal muscles while you lift your legs in a curl, following the pattern imposed by the machine. You hands in this case must remain in their upright position. Hold for some seconds; bring your legs back to position and repeat. In this exercise, the Ab lounger is adjusted to a lying position. Place your head comfortably on the arm that you are lying on stretched out. Hold the straps with this hand. Rest at your limit for a moment before bringing your leg down to rest and repeat the motion for about 5 to 12 repetitions per side. Back to Weight Training Home.